Having an accident can often be a very traumatic experience no matter how big or small the damage is. 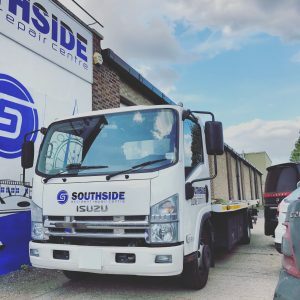 Here at Southside our aim is to make the whole process as stress free as possible for you. Having completed an estimate on your vehicle, all you have to do then is provide us with your insurance details (or the third parties insurance details) and we will do the rest. If you require a car we can arrange this for you and if it is a non-fault accident, we can even arrange for you to be put in a like for like vehicle whilst yours is being repaired. We will keep you informed throughout the repairs and aim to get your vehicle back on the road as soon as possible. Upon completion of the repairs, your Insurance company may require you to pay an ‘Excess’, this is payable to ourselves and a collection note signed, you are then able to drive your car away and we will finalise everything with the Insurance Company. Ensure your vehicle is roadworthy before you drive it again. For example, check that the lights still work, there is no dangerous bodywork or sharp edges that may injure other road users and there are no leaking fluids. Remember it is YOUR VEHICLE and YOU CAN CHOOSE who repairs it. Many Insurers have networks of their ‘Approved’ repairers; they may try and convince you to have your car repaired where they choose. This is for their convenience, not yours! Don’t be unduly influenced by insurer’s suggestions of delays and extra costs if you don’t do as they say. You are entitled to consider the benefits of dealing with the garage of your choice, including the eventual trade in value of your vehicle and the consumer protection of a recognised code of practice. You may also have obligations under contract hire or lease agreements. Remember you are NOT obliged to have your car repaired at an insurance nominated garage. Please refer to Accident management page. Your policy excess is the amount that you must pay towards the repair bill. You will need to pay this to ourselves when the repair is completed. In some cases, we may even be able to help pay towards your insurance excess (T&C apply) and for third party claims, you may be able to reclaim this back from the third party if the accident was not your fault. Your insurer may choose to ‘write off’ your vehicle making it a total loss. This could occur when the repair cost is very high in comparison to vehicle market value. If this happens they will pay you the money and keep the vehicle to dispose of as they see fit. Only one estimate is required. We will provide this and agree cost of parts, labour and materials with the insurance engineer who will come to inspect your vehicle whilst it is with us. These are provided by ourselves FREE of charge to make sure you are not inconvenienced by your Accident.